Over the last two decades, conventional (Z0-based) ICG has been improved and tweeked. However its fundamental dependence on the unreliable baseline thoracic impedance (Z0) could never be overcomed. And Z0 proved to be random value in too many cases. To solve the problem, impedance cardiology was reinvented by PhysioFlow to be independent of baseline thoracic impedance (Z0). The breakthrough that accomplished this was to use the morphology of the impedance signal (pure waveform analysis), instead of its baseline value, a patented-approach called Signal-Morphology Impedance Cardiology (SM-ICG™). SM-ICG™ provides accurate, reproducible and sensitive measurements even in challenging measurement conditions and difficult patients, pushing the limits of noninvasive hemodynamic monitoring. What is impedance cardiography ? Impedance cardiography (ICG), also referred to as thoracic electrical Bioimpedance (TEB) and electrical impedance plethysmography (EIP), has been researched since the 1940's. With ICG, disposable sensors on the neck and chest are used to transmit and detect electrical and impedance changes in the thorax, which are used to measure and calculate hemodynamic parameters. How does ICG Work ? A low magnitude high frequency alternative current is transmitted through the chest. ICG™ measures the Baseline Impedance (Resistance or Z0) to this current together with variations induced by the respiration and the cardiac flow. The sensed impedance signal (delta Z or dZ) is then processed and analyzed together with its derivative over time (dZ/dt) a mirror image of dP/dt. Both signals are pulsatile waveforms. How does standard ICG (BioZ, Niccomo, Osypka and Analogic etc ...) compute Stroke Volume ? Standard ICG filters out the respiratory component of the impedance signal but uses the impedance baseline in the equation to compute Stroke Volume (SV) and subsequently Cardiac Output (CO = SV X Heart Rate). The impedance baseline (Z0) is combined with an estimation of the shape/volume of the thorax, and L (length) or distance between electrodes to estimate thoracic fluid content (TFC). The TFC is used as a reference to analyze the pulsatile components of the signals (dZ and dZ/dt). The pulsatile waveform is indeed the part of the impedance signal that is in motion in accordance with the blood flow generated by the heart. What are the limitations of standard ICG ? Standard ICG works only in normal or near normal patients and exclusively at rest or very moderate exercise. Obesity, pulmonary edema, emphysema, ventilation are some known limitations to ICG. It is very sensitive to electrodes placement and therefore not very reproducible from one operator to another. What is the origin of these limitations ? The impedance signal is of very low magnitude (1/1000 of the magnitude of an EKG signal) and therefore its sensitivity to interferences and artifacts is high. 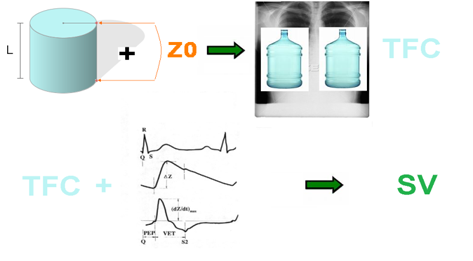 The Z0 parameter, which is key in the classic equations, is highly inaccurate when the patient is not normal or near normal, not at rest or when electrode placement is sub-optimal. How to improve the robustness/stability of the signal ? It is now possible to improve the stability and signal/noise ratio of impedance cardiography thanks to newly developed filtering techniques. Two methods have been offered on the market recently: SM-ICG™ (PhysioFlow®) and Bioreactance®. They have proven to advance the landscape in impedance cardiography. How does Bioreactance® work ? The Bioreactance® approach is based on the assumption that when blood flows out of the heart, phase shifts are created in alternating radiofrequency electrical currents applied across the patients chest wall. Such phase shifts are conceptually similar to a Frequency Modulation, of FM, as used in FM radio transmissions. The phase shifts are measured continuously and have been shown to relate almost linearly to blood flow in the aorta. Just like FM and AM radios, Bioreactance® plays the same "impedance" music, but with a clearer sound. How do SM-ICG™ filters work ? SM-ICG™ uses a first level optimized input filter finely adapted to the high frequency current transmitted, so that the Impedance signal measured is mostly free from noise coming from other electronic or physiologic emitters. 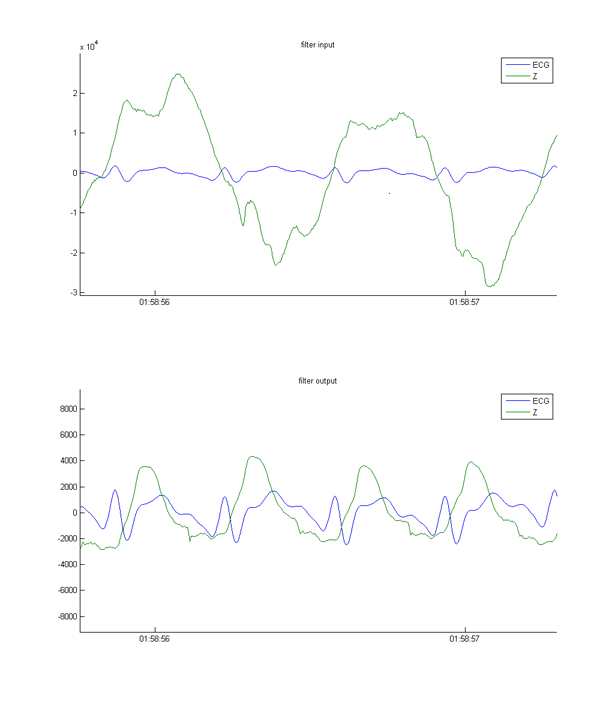 In these two cases the signal is totally stable and reproducible after application of the HD-Z filter. What are the similarities between Bioreactance® and SM-ICG™ ? SM-ICG™ has been pioneering a radically new approach in ICG. The calculation of SV is entirely based on a morphological/Differential analysis of the impedance waveform, factoring out the problematic impedance baseline (Z0) from the equation. 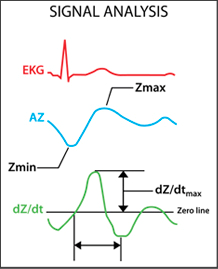 The dZ and dZ/dt signals are electrical representations of the blood flow generated by the heart, just like a Doppler waveform is an ultrasound picture of the flow. It is immediately evident that a heart failure patient and an athlete present very different waveforms and that these waveforms contain the necessary information to compute SV. The designers of Bioreactance® have used the same approach ten years later and applied it to their "FM" signal, which looks identical to the SM-ICG™ signals when measurement conditions are optimal. Below is an example of Bioreactance® signals as an illustration of that fact. 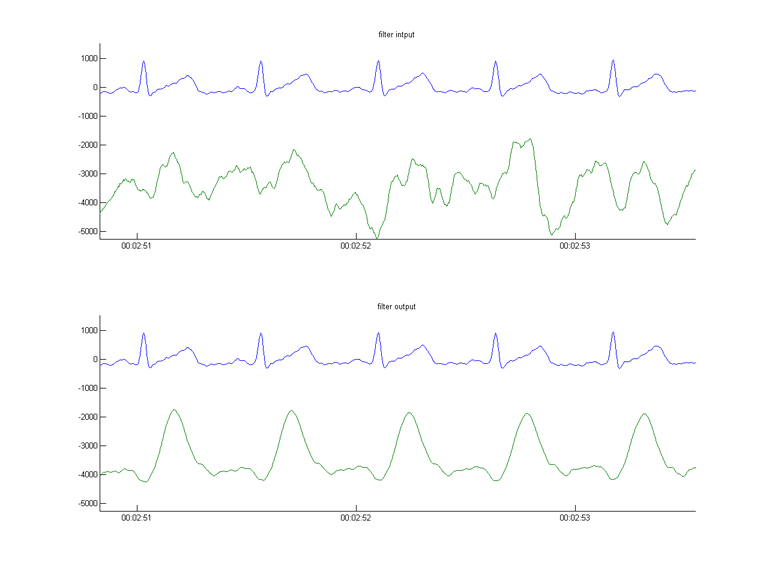 Please compare this signal to the SM-ICG™ signals from above, especially those of the ventilated ICU patient. What is the difference between Bioreactance® and SM-ICG™ ? Just like FM and HD radios are two generations of radios, Bioreactance® and SM-ICG™ (HD-Z™) are two generations of impedance cardiograph signals filters. FM radio and Bioreactance® share the same set of flaws. In relation to its poor reception, FM radio contains cracks and distortion. Similarly, Bioreactance® is sensitive to a sub-optimal measurement environment. As a result, the Bioreactance® designers have limited it to a long one minute averaging time to guarantee there is an adequate amount of "good" beats to provide a visually stable average. On the contrary, the HD-Z™ filter extracts the useful and clear information from a noisy signal in a dynamic manner, enabling shorter averaging times and more "information-rich" trends. PhysioFlow® has been proven to cancel noise from even extreme measurement environments like marathon races or maximal exercise testing of highly trained athletes. No other device has been successfully used in such difficult conditions and provides clinically useful information in such a dynamic fashion. Another unique and published benefit of SM-ICG™ compared to other systems is that, thanks to the clarity, level of details and stability of its filtered signals, the practitioner can use it to see abnormalities on the waveforms that are signs of probable cardiac pathologies like ventricular dissynchrony, fluid overload, and ventricular stiffness. Therefore SM-ICG™ enables early detection of possible heart conditions that are potentially very detrimental to the patient if not treated on time. Bioreactance® and SM-ICG™ are two new generation ICG systems, applying similar concepts to improve the technology. SM-ICG™ has pioneered the pure morphological analysis of the signal, followed by Bioreactance®. SM-ICG™ applies a more advanced filtering technology with proven results in the most difficult measurement environments.